The Metrodata FIMO-2000 is a standalone fiber optic extension unit for carrying synchronous serial data. The FIMO-2000 supports data rates up to 8.192Mbps and is fully configurable in Nx64kbps steps. Please Note: The FIMO-2000 has been superceded by the newer more flexible FIMO-2100 unit which offers improved functionality. However the FIMO-2000 is still available on a longer lead time. Please contact Metrodata for further information. The FIMO-2000 units are used in pairs across the fiber link. The FIMO-2000 serial interface is presented with both DCE and DTE ports, which each support multiple standards including RS-232 and EIA-530 directly, and V.35, V.36 and X.21 through the use of external adaptor cables. The user application determines whether the DCE or DTE port should be used on each unit, and this also affects the polarity of any cabling. Full details about application configurations and cabling options are available in the user manual. The FIMO-2000 presents a DTE or DCE interface with the active interface type selected via a bit-switch. A cross-over function supports DCE to DTE, DCE to DCE or DTE to DTE formats. The FIMO-2000 supports clock generation from 300bps to 38.4kbps for low speed RS-232 applications, and Nx64kbps from 64kbps up to 8.192Mbps for high speed applications (EIA530, X.21, V.36 and V.35). 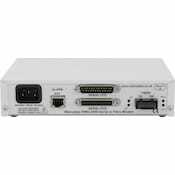 The RS232 interface will also operate at up to 256kbps when in clock pass through mode. The maximum operating distance of the FIMO-2000 is 5km using multimode fibre, or up to 30km or 70km using singlemode fibre, although specific installations may only operate over lower distances due to the variations in losses of different types of fibre cable, the use of connecting fibre cables, or patch panels. When operating over 50% of the maximum distances it is advisable to calculate all fibre optic connector and cable losses and compare these with the fibre optic loss budget specified for this product. All Metrodata fiber converters are supplied as standard with SC connectors operating at a nominal wavelength of 1300nm. Other wavelengths are available on request, e.g. 850nm, 1550nm, 1550/1300 WDM. Other connectors are also available on request, e.g. ST, FC. An array of LED indicators provide status and activity monitoring, and an alarm extension relay may be used to transmit Alarm conditions such as Fiber Optic Link Down. The FIMO-2000 range can easily be rack mounted in either a 1U two unit rack mount kit or in a 6U eighteen unit rack mount kit . The FIMO-2000 is part of a range of products from Metrodata, offering fibre conversion solutions ranging from 300 baud RS-232, via Nx64kbps rates, through 2Mbps and up to 155Mbps for electrical to fibre conversion; or 155Mbps, 622Mbps or Gigabit Ethernet for fibre mode or wavelength conversion. The application shows how RS232 devices can be connected together over multimode fibre using FIMO-2000 units. DCE-DCE, DCE-DTE and DTE-DTE modes are supported for both async and sync RS232 devices. The maximum operating speed is 38.4kbps when the FIMO-2000 units are generating clocks, otherwise a maximum operating speed of 256kbps is supported in pass through mode. This multimode fibre could be within a building (e.g. between two PBXs at either end of a large hotel), or across a campus (e.g. between two departmental buildings of a University). The application shows how EIA530 routers can be connected together over multimode fibre using FIMO-2000 units. The data rate is configured as Nx64kbps up to a maximum operating speed of 8.192Mbps. This multimode fibre could be within a building (e.g. between two PBXs at either end of a large hotel), or across a campus (e.g. between two departmental buildings of a University). This application shows how a pair of FIMO-2000 units can be used to extend an EIA530 DCE-DTE connection over singlemode fibre, e.g. from a modem or NTU to a router. The FIMO-2000 operates in a data agile mode which means that it automatically tracks the data rate of the modem up to the maximum operating speed of 8.192Mbps. This singlemode fibre could be between buildings (e.g. across a business park), or across a city (e.g. over a rented fibre). This application shows how a pair of FIMO-2000 units can be used to extend a V.35 DTE-DTE connection over long haul singlemode fibre up to the maximum operating speed of 8.192Mbps, e.g. from a modem or NTU to another modem or NTU. This singlemode fibre could be across a city, or between cities (e.g. over a rented fibre). FIMO-2100 unit which offers improved functionality. However the FIMO-2000 is still available on a longer lead time. Please contact Metrodata for further information.